I’m no writer in any sense of the word, but have read and heard about my friend the pompano not taking a bait ’till I’ve just got to squawk. I have been taking them on light tackle for over thirty years and saw it done before that. My wife and I own a cabin at Grayton Beach, which is in this county (Walton), and spend every day we can there. We usually begin catching them in mid April and the season continues ’till late Fall. Fourteen was our record day’s catch this past summer, but we took as high as ten on several occasions. They run from two to six pounds as a rule but I caught an 8 3-4 pounder several years ago. They are absolutely tops for speed and gameness. When you land one or two on light tackle you are a hopeless addict. Can’t express myself on paper but do wish I could get just one or two of the fellows that say it can’t be done to come up and let us how them how. Am sending under separate cover some of the dope I’ve learned about this fish. If you can use it do so. Am also sending some snapshots including one of the pair I caught last June on one cast. The larger is a female and Weighed six pounds. The smaller is a 3 ½ pound male. I am an avid reader of your magazine and enjoy it very much. May your shadow increase. K. R. Smith, DeFuniak Springs, Fla.
P. S. – These fish spawn up here, that’s why they are in pairs. Perhaps that’s why they strike. Now look here, Mr. Smith, you have us all confused. 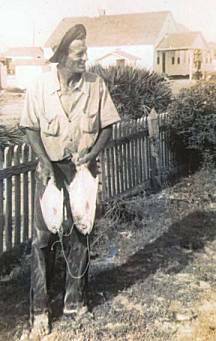 In your opening sentence you say “I’m no writer in any sense of the word, BUT…” and then you go on to write an absorbingly interesting article on pompano hook fishing out in good old Walton (article follows). And for heaven’s sake, what is a pompano bird? Now don’t you tell us you catch them on hooks, too. Fly fishing, perhaps? – Editor. We “fishheads” over in this part of the state start looking for sand fleas, pompano birds and pompano about the middle of April each year. The sand flea (or sea flea) lives along the beach and comes in with a breaker, burying its body as the wave recedes. There are millions of them and they are the most commonly used bait for this fish. Personally I would much rather use the small needle crab which is to be found in the wet sand a few feet higher up on the beach and which buries in much the same way as he sand flea. These are the only baits with which I ever caught pompano. The “pompano bird” is one of the lesser sandpipers common to all our beaches. When these birds show up in the spring one may be sure the sand fleas are on the beach as the young flea is this bird’s favorite food. The commercial fishermen make many hauls of pompano before any are caught with rod and reel for the reason that the fleas are not out yet. When the conditions are right and the sun warms up the sand the pompano begin showing up in pairs. The larger of the two is usually the female and the smaller the male. They seem to travel the shoreline searching for fleas; following the deeper water between the inside reef and the beach. I have hooked many a fish within thirty feet of the shore, but the pompano that sees you first is the one you don’t catch. I have read a lot on bonefishing and it is very similar to the pompano. He is a very shy citizen. As to tackle, we use the standard freshwater rod and reel. Perhaps the most popular is the 150 yard service reel or light salt water reel of the same type. There are many kinds used, however, but the lighter the better. The line must be either white or natural color, and again, the smaller the better. One will land twice as many pompano on a six thread line as he will on a nine or twelve. The sinker or casting lead and the hook used are very important items. I make my own leads of various weights as a heavier lead must be used in a rough sea. This one weighs around two ounces. On a calm day one ounce is sufficient to cast. The lead should be flat to prevent the surf and tide rolling it back on the beach. My pet lead is triangular in shape with a small hold for the line in the apex. The hook should be of the O’Shaughnessy type and in a bright finish. Never use a bronze or black hook, and you will catch more fish if you pass up the offset variety. As to hook size, either the 2/0 or 3/0 are about right, the 3/0 being a bit better when the fish are running large. The spare hook which used to come in the box with the Al Foss Shimmy Wiggler was the ideal and I kept a record of over fifty pompano caught on one of these hooks before a skip jack (Lady fish to you) cut it off. These two pompano, apparently happily married, were caught on one hook by K. R. “Tuff” Smith of DeFuniak Springs. To make up the rig tie a short loop in the end of the line. Pass this loop through the hole in the sinker. Then drop up the line 16 or 18 inches and catch another loop long enough to allow the hook to pass through and tie off forming a snood not over two inches long. Pass this loop through the eye of the hook, back over the barb and draw tight. If two hooks are preferred, (which sometimes pays off) go up the line another foot and repeat. Some use a sliding lead with one hook at the end of the line which is a good way, but sometimes tangles when cast. When using this type a match stem should be looped into the line to keep the lead free of the hook. The bait is about the size of a pecan and should be impaled on the hook cross wise with only the point showing through the shell. I usually catch my bait as I fish, carrying a few extras either in my pocket or in a small cloth bag we make for the purpose. Sand fleas will stay alive for days if kept in a bag or pail of wet beach sand. Now for the fish. The man or woman who stays on the beach all day will catch the pompano. They strike only when they are hungry and there is no fallible rule to follow. One day they will feed on an incoming tide, next day on a falling tide and the third when there just ain’t no tide at all. Today you will catch them in a heavy surf and tomorrow on a dead calm. You may see fifty and not get a strike and again see four and catch them all. My wife and I are genuine dyed-in-the-wool pompano nuts. We have a good boat on one of the fishiest rivers in Florida where the bass and big Bluegills are plentiful. But, let the pompano birds arrive at the beach and the sun warm up the sand. You will find us ready to spend every hours of spare time with the “pomps.” And we catch ’em.